That’s a dictionary definition. I’ve also read that trust is as simple as the ability to predict another’s behavior. Or just faith that a person will not harm you, or is not capable of crossing certain boundaries. It’s all of these things to me. 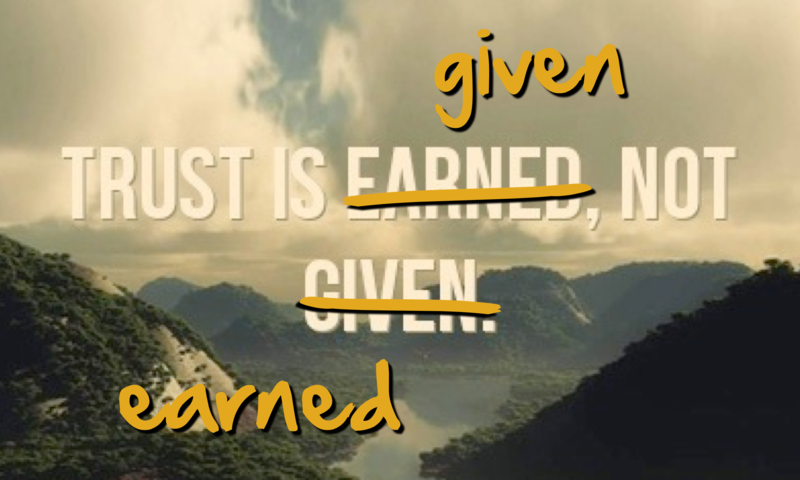 I give trust, then it is earned. It’s a cycle. On the other side, it works the same way. I take trust away when it’s broken. Also a cycle. But it’s more than just a transaction to me. It is a kind of faith. To be worth something—anything—it must withstand mistakes and challenges. When it is earned, however, it transcends. It grows exponentially. It becomes so much more than when it was given. What about you? Is trust earned? Is it given? It it something else, something that just grows naturally, without any conscious attention? What are the components of trust? Is trust different on either side of the slash? I’ve posted a few thoughts. I have more, of course. I don’t want to influence anyone, though, as I love the idea of getting your honest and gut-instinct responses. Write a sentence. A paragraph. An essay. Or whatever this is to you. Talk it out. Make it yours. I’m looking forward to reading your responses! Previous PostPrevious Give Compliments. Lots of Compliments. Do It Right In 9 Easy Steps. Next PostNext I Want You. Now, Please Do All The Work.